MWC 2012 Nokia chief executive Stephen Elop might be remembered as the Thomas Watson of our time, based on his remark you don't need quad-core processors for smartphones. "You don't need a quad-core phone unless you want to keep your hands warm in your pocket,” said the Yankee CEO brought in to re-float the Finnish ship. If we’re being kind to Elop we might suggest the former Microsoft man is chained to such statements, given his company’s first Lumia phones running Windows Phone have used single-core Qualcomm Snapdragon processors. But Mark Shuttleworth, founder of Linux distro Ubuntu, isn’t cutting Nokia’s man any slack. Shuttleworth reckons Elop is “short sighted” – and Canonical is today due to unveil Ubuntu for Android, a version of Shuttleworth's Ubuntu juiced by multi-core on smartphones. Ubuntu for Android, which will be demonstrated at Mobile World Congress in Barcelona, Spain, next week won’t run Ubuntu on a smartphone. That would be impossibly stupid and impossible to use. For now. “We are not announcing the Ubuntu for the phone experience – that will come, “ Shuttleworth told The Reg. 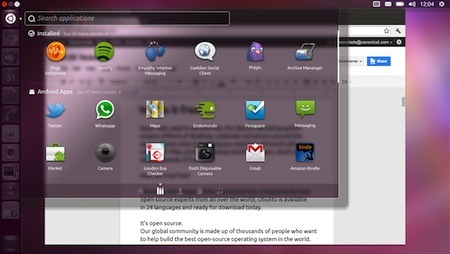 Instead, Ubuntu for Android pairs up with Android. Your smartphone runs Android when it’s a phone but when you plug into a monitor or dock, Ubuntu kicks in. Plug in a keyboard and you’ve got Ubuntu – with the phone serving as your desktop computer. “We will launch the Ubuntu user experience on the phone...” Shuttleworth said. Ubuntu for Android works off the Android Linux kernel with some modifications: you won’t, for example, use the Ubuntu address book – you use Android’s contacts – and when Android is plugged into the desktop, it uses Ubuntu to detect the network. Microsoft-a-holics get the Office and apps suite experience thanks to thin-client software from Microsoft, Citrix and VMware serving Office and other apps via remote server. Slicker IP networks – especially LTE networks – have cut latency from 150 milliseconds to 20 milliseconds to make it more like using a piece of software locally, Shuttleworth says. Ubuntu for Android is a fresh push by Canonical to get on more desktops at the expense of Windows and before Windows "waverers" buy a Mac – only this time it’s riding in on the popularity of non-Microsoft smartphones and fondleslabs. In years past, Canonical tried dual-boot on Windows PCs, a program that has failed and been withdrawn. Microsoft isn’t standing still, though: Windows 8 is coming not just to x86 PCs but also to tablets running x86 and – for the first time – ARM. Windows 8 sports a touchable UI called Metro that has been built for use on tablets. Microsoft is gambling that Windows tablets can copy Apple’s iPhone and iPad by making a successful break-out among business users. Shuttleworth reckons that while Windows Phone is a credit to Microsoft, Windows 8 is headed in the right direction in terms of convergence but it has a problem because of the sheer number of legacy apps not allowed by Microsoft to run on Windows 8 on ARM. “They [Microsoft] have to convince an industry that’s been successfully shipping Android for the last three years to get a whole new set of factory processes together around Windows. We are in the position where we can give people a great desktop experience but it’s still Linux,” Shuttleworth said. “We really know the desktop and spent a lot in time the last two years trying to leapfrog Windows and get to a future of a fully converged set of experiences. Microsoft figured out the same stuff with Windows 8 but we think we can get there before them.